Hari Batti's Green Light Dhaba: Copenhagen Crystal Ball: Green Light's Five Decade Forecast? More warming! Today we're giving you the Copenhagen bottom line. Or lines, actually. Climate negotiations for your dumb roommate, or someone else in your life who cares, but not enough to wade through the World Wide Web. But please do not expect a lot of hyperlinks; it's Sunday morning, my friend, and link-link-linking is just too much to ask. I'm not even going to give you a lot of numbers, though most days, I love to do that. If you find holes in this analysis, what can I say? I tried to get a couple of interviews, but the experts were all too busy doing important stuff in Denmark. One can only imagine what that must be like, but I bet if you google or search twitter, you can get some great first hand reports. Next time, somebody can give me a free trip to Copenhagen or where ever, and then I'll give you hyper-hyerlinks, lots of numbers, and a tight-as-a-drum analysis. Still, all excuses aside, I think the basics of this are sound enough. Trust me. Just don't quote me-- at least not today. OK, there are, depending on how you look at it, three or four main camps at these negotiations. I say four. We'll call them RICH; USA; EMERGING; and SINKING. But of course there are differences within all these groups, and many countries will be reading the room before they take a firm position. These are the European countries, mostly, that are relatively serious about climate change. The European Union, for example, has already said that by 2020, they would try to reduce emissions (not emission intensity, but actual emissions of green house gases) from 1990 levels by 20 percent. They'll do 30 percent if the other industrialized countries get on board, which is not going to happen if they are counting on the US. RICH countries have been talking about helping out the poor countries to the tune of $10 billion. Which all seems good except that when you realize most serious scientists think we need to reduce overall emissions by 40 percent, not 20 or 30. Also, not all of the $10 billion in European money is really new money. And consider the fact that it cost the US something like $700 billion to destroy and partially build just one county, Iraq. Rebuilding the world's energy infrastructure in a low-carbon way is going to cast way more than that. Some of the RICH countries floated the infamous Danish text that was leaked to the Guardian last week. That proposal had large developing countries "peaking" their emissions sometime in the 2020's. It's not going to get the support of most of the developing world and is probably dead in the water. Whatever proposal this RICH group gets behind, there is some question as to whether it will be a legally binding treaty or merely a non-binding "political commitment". Does it matter, given the Kyoto protocol was legally binding, but very few countries met their Kyoto targets? Probably it does matter, but we'll have to look at that issue later. Whatever Obama might or might not want to do, he is constrained by the politics of the US and is not going to offer to do anything like what needs to be done. Please note that all US proposals call for reductions from 2005 levels, not 1990 levels. That makes a HUGE difference, since US emissions grew by a large amount between 1990 and 2005. US spokesperson Todd Stern is always saying obnoxious things about the developing world, suggesting WE are not doing enough. For example, he says we won't get a "pass" this time, that "you've just got to do the math". Americans like to "get tough" on abstract nouns. They are always getting tough on things like crime, "terror", immigration and drugs. Stern's talk is part of his effort to prove America is ready to get tough on China and India. But it's stupid. Please, Mr. Stern, before you open your mouth again, maybe you should "do the math". Start by adding up these numbers: the historic percentage of green house gas emissions produced by the USA alone; amount of goods made in China's factories that are actually consumed in the US; and the per capita emissions of people living in the USA. Why not throw in the number of countries that never signed the Kyoto Protocol. You can express the answer to this sum in one word only: shameful. But in spite of USA's track record, everyone likes to be friends with Uncle Sam. America's calls for easy targets that are not legally binding will be appealing to a lot of countries. III. THE DEVELOPING COUNTRIES THAT SEE GROWTH IN THEIR FUTURE (EMERGING): That's us: India, China, Brazil, South Africa are leading this group. We want to sock it to the US and Europe, but are unlikely to get what we need from them in terms of technology and financial aid. For our part, we are willing to become more efficient polluters. Of course our per capita emissions are much, much lower than those of Western countries, because we have hundreds of millions of people living in extreme poverty. Unfortunately, too much of the development we are pursuing seems aimed at providing opportunities for our own elites to consume like Westerners. (To be fair, much of the pollution coming from China is actually making it possible for Westerners to continue to consume like ...Westerners!) But one has to be clear: we do need some room to develop in a sustainable, just way, and the West owes it to us to move over and give us a fair share of the atmospheric space remaining. EMERGING countries are not going to accept cuts that hurt very much for now. The cuts in emission intensity that India is offering represent something like a business-as-usual approach, with a few tweaks. The best analysis I've seen of these can be found at Reporting on a Revolution. The Chinese cuts are more ambitious and do show some recognition of the need for serious action. SINKING countries are demanding real action on the part of everyone, including the EMERGING nations. They have little to cut themselves, and they are the most vulnerable to the affects of climate change: drought, flooding, rising sea levels, etc. Some of them might be willing to compromise with the RICH countries in return for financial compensation. If they are going under anyway, then that might be the best they can do. Lets not forget the movement activists that are in Copenhagen. On Saturday, tens of thousands took to the streets, calling for a "real deal." About 1,000 were arrested. These are the seeds of the movement we need, but I don't think they'll fundamentally change the landscape yet. There are also a lot of countries who just want to get something done that will look good at home. OK, there have it. Not bad, for a Sunday. If you have a complaint, please send it to complaintdepartment.com--or leave a comment below! excellent post. and for someone who said no links, you've provided a fair number of them! @space bar--thanks. as for the links, it's my obsessive-compulsive side, plain and simple. How sad that these were the exact bargaining positions that prevailed even before Copenhagen started! No one has changed their positions. I wonder what the purpose of the conference is if everyone's positions are grounded in hard rock. Interestingly, I also wonder how the previous Kyoto protocol was passed at all. True, the US never ratified it (though it signed it), but why are "rich" countries so keen to chuck it out of the window when they agreed to it a while ago? @Bhagwad--It is hard to say what will happen in the last few days. I've got a new post coming up that updates things a bit, but not much has changed. I don't think either India or the US are interested in doing anything significant. At the end of the day, they may even blame each other and then make nice. India is doing a false populist/nationalist thing. US would like to get kudos for doing something small. China wants to do something, because they want the current system of production (by them) and consumption (by the West for now, but later maybe by a more healthy Chinese consumer class) to continue. Hats off to the small island states for taking a stand. Should be an interesting week and beyond. A very interesting post! The CoP15 is turning into a farce that everyone hoped it would refrain from becoming. What India needs now is to start its own intitiatives in reducing emissions in an earnest manner. 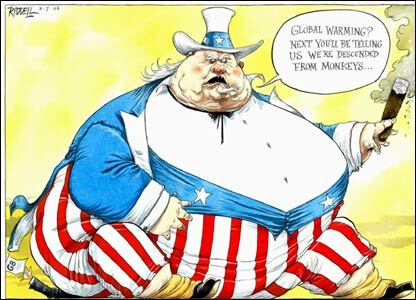 I am very skeptical about the USA ever joining emission reduction talks in a positive manner. @chandni I'm afraid you are probably right. Things don't look so good right now, and we certainly can't count on the US to do the right thing. Glad you stopped by!